MANILA, Philippines — (RELEASED) The Professional Regulation Commission (PRC) and the Board for Professional Teachers (BPT) released results of March 2018 LET or teachers board exam on May 23, 2018 or in forty (40) working days after the exam. The complete list of passers, top 10 (topnotchers), top performing schools and performance of schools for Elementary and Secondary level are available on this page as announced online. 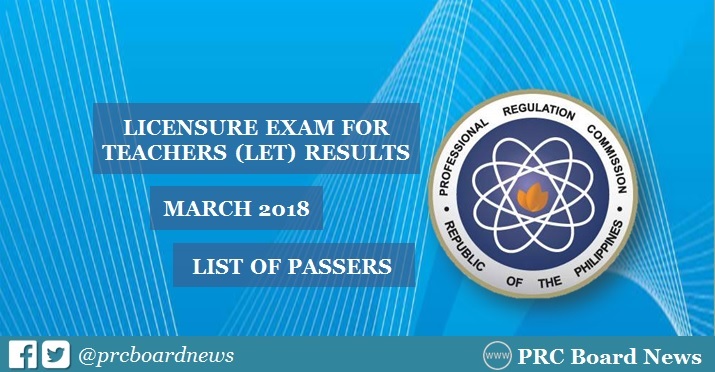 PRC administered the first LET board exam this year on Sunday, March 25, 2018 in at least 20 testing centers nationwide: Manila, Bacolod, Baguio, Cagayan De Oro, Catarman, Cebu, Davao, General Santos, Iloilo, Kidapawan, Legazpi, Lucena, Occidental Mindoro, Pagadian, Palawan, Romblon, Rosales, Tacloban, Tuguegarao and Zamboanga. "Successful examinees should PERSONALLY register and sign in the Roster of Registered Professionals," PRC said. PRC's projection excludes 8 Saturdays and Sundays and 5 holidays namely Maundy Thursday (March 29), Good Friday (March 30), The Day of Valor (April 9), Labor Day (May 1) and Barangay and SK Elections (May 14). A total of 58 calendar days or nearly two months was calculated. From time-to-time, PRC Board News will update this page to give the exact release period. In the same period last year, results were released in forty (40) working days after the exam. A total of 5,600 elementary teachers out of 53,915 examinees (10.39%) and 18,482 secondary teachers out of 72,584 examinees (25.46%) passed the exams. Samantha Christel Chua Gaerlan from De La Salle University (DLSU) - Manila led the Elementary level exam with 90.60%. University of Mindanao (UM) - Davao City alum Marian Kaye Fortinez Gallego topped the Secondary level. None of the schools qualified for the top performing school list for Elementary. Meanwhile, University of the Philippines (UP) - Diliman topped the schools for Secondary. March 2016 LET results were announced in forty-one (41) working days. A total of 12,128 elementary teachers out of 42,739 examinees (28.38%) and 18,810 secondary teachers out of 53,090 examinees (35.43%) successfully hurdled the one-day exam. Rowena Miano Hingpit from UM-Davao topped the elementary level garnering 90.60%. Michael Prince Notorio del Rosario from Lorma College led the passers for Secondary level, 92.00%. None of the schools qualified for the elementary level top performing school list. UPD also dominated the secondary level exam. April 9, 2018: Review center owner Dr. Carl Balita hinted the possible release of LET results: "When the high five doubles the square adds up to a square, the DREAMS and the DREAMERS become ONE." May 1, 2018: LET the countdown begin. Results are out this month! May 14, 2018 Update: Carl Balita of CBRC, a reliable source for the release of LET results, confirmed that results will be released next week. May 20, 2018 Update: Reliable source hinted that LET result would be released on May 23. "When the sum of the day equals with the month, God will LET DREAM and the DREAMER be ONE," popular review center owner Carl Balita shared. Lapit na release ng LET results. Good luck sa ating lahat! #Heartbeatfast. God bless po sa ating lahat. To God be thy Glory!!!! WALA PA PO BA? KELAN PO POSSIBLE RELEASE OF RESULT? May LET results na daw? Tonight na po ba release of LET results? Possible po ba this day ang result? God please help us! Eto na po pinakahihintay namin na LET result. May result n po b?? what time po yong result?? May result n.a. po ba? Thank you. Papasa tayong lahat sa ngalan ni Jesus, Amen! my result na po ba ng LET exam? cONGRATS po sa lahat ng nakapasa! Ang kalooban mo panginoon ang masusunod. pagpalain mo lahat ng umaasang sila ay papasa. When we look at the results so we come to know that the result ratio is increasing dramatically and we are moving in the right direction with the help of https://www.dnpcapstoneproject.com/dnp-capstone-projects-services/ to provide better education to the students. It is necessary that the students get notified of their results within the forty days of the exams because they have some other plans as well so they read this post every day to find out who did qualify for the seats. There is some problem in presenting their cases so the time is there for them to click https://www.lawessays.org/how-to-write-a-brilliant-paper-using-autobiography-essay-example/ so they can share what is there in their minds. We pray together that we all pass the board exam. We know that God will help us to pass. The official passing out of the students is declared by the institute. The successful students are enlisted with the approach of the personal statement for fellowship for all future candidates. The teachers of the institute are hardworking for the enlisting of the students with good and remarkable marks in the school. The library page is painted and designed for the success of the persons. The utility of the more info is inducted for the candidates. The positive use of the page is identified for the mutual use of the tools for the aspirants of the page.